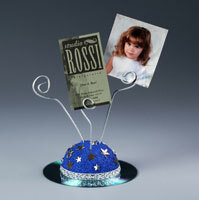 Picture your child in this perfect CD photo clip. It's great for your desk at work and it takes up minimal space. Silver metallic trim, 1/4" x 1/3 yd. Wax serrated knife with candle stub or paraffin. Cut foam ball in half; set aside one half for future project. Insert skewer into flat side of half-ball. Holding skewer, paint half-ball blue. Place skewer in heavy glass or jar to dry. Use glue gun to secure half-ball to center of recycled CD. Cut three 6"-8" lengths from wire. Use fingers and pliers to create flat spirals in one end of each wire length. Glue and insert straight wire ends 1/2" deep into foam at different angles as shown. Glue assorted gems and sequins to foam surface. Glue metallic trim around base of ball; trim excess.